Running a news site, a magazine site or a content-heavy blog isn’t easy, and it’s made even more difficult when you consider how unlikely it is for readers to pay to read the content on your site. There are ways to encourage them to do so, but it can be much more efficient to simply display an ad for them to view to ensure your site generates revenue in one way or another. Why use ad networks like Google AdSense to display advertisements? An ad network is a company that connects advertisers to websites and various platforms that wish to host ads to generate revenue for their businesses. Google AdSense is one of the largest ad networks in existence. If you’ve ever seen an ad on the internet, chances are it served from Google AdSense. Anyone can sign up for an AdSense account and host ads on their site, so long as they do not violate the program’s terms of service in any way. Once your Google AdSense account is approved, you can begin serving ads on your site, which you’ll do by creating ads inside the Google AdSense control panel and pasting the code on your site. What are Google AdSense optimized WordPress themes? This is where Google AdSense optimized WordPress themes come into play. If you want to place an ad in the sidebar of your site, in the header or throughout a post, you need the code to be read properly so it outputs advertisements correctly. That’s what these WordPress themes allow you to do. AdSense optimized WordPress themes offer several ways to display ads across your website. Each one of the WordPress themes below is different, but they make it easy to implement ads on news sites, magazine sites and professional blogs. We’ve handpicked for you some of the best AdSense optimized WordPress themes to easily monetize your WordPress website or blog. 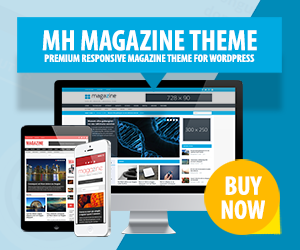 MH Magazine is one of the most popular magazine and news themes for WordPress. This flexible magazine theme offers plenty of possibilities to display advertisements across your website. You can place ads and banners into or above the header, into various widget areas on the front page, into the sidebars, into the footer of your site and there are options to display ads within your post content and between posts on archives as well. MH Magazine is a popular AdSense optimized WordPress theme which you can use to easily monetize your WordPress website or blog. Divi is a multipurpose WordPress theme powered by the Divi Builder, a WordPress page builder plugin developed by Elegant Themes for the Divi theme. This flexible WordPress theme allows you to build a custom website from the ground up without ever writing a single line of code. There's a special tab in the control panel for the Divi theme that allows you to enable ads. You can upload your own image or insert your own Google AdSense code. Newspaper also is one of the most popular newspaper and magazine themes available for WordPress. It has over 40,000 sales on ThemeForest. It comes with multiple demos, each of which is designed for a different style or niche, including Food Recipes, Beauty Blog, Travel Blog, World News and more. It also comes with support for advertisements, which includes the ability to use a specially-created ad widget. It even comes with a custom spot in the admin panel you can use to add them, and different screen sizes will display different types of ads. GoodLife is another WordPress magazine theme. This one has fewer demos, but they each cater to a specific niche, including travel, lifestyle, sports, tech, video games and more. The GoodLife theme also comes with Visual Composer, which the developers have utilized to include powerful advertising capabilities. These capabilities allow you to place ads virtually anywhere on your site using the custom content modules the developers have built into Visual Composer. The Voux is a multipurpose magazine theme that features an elegant, chic style that suits fashion, style and lifestyle niches best. It comes with multiple homepage demos, some of which cater to specific niches while most simply feature different layouts. Advertising capabilities are dependent on the demo you choose to use. Some allow you to use an ad spot in the header while others only allow you to feature an ad beneath the fold. GOLIATH is a fully-fledged magazine theme. It only comes with four homepage layouts, each one catering to a different niche, but it's also jam packed with loads of features that allow you to customize the homepage to your liking. One of those features is the ability to use advertisements of different sizes throughout the homepage, be it the header, your blog feed or your sidebar. You can even control them using the custom Planeshine Control Panel built into the theme. Extra is another theme powered by the Divi Builder, but this one is a dedicated magazine theme instead of a multipurpose theme. It comes with the same ability to customize your site to your liking thanks to the Divi Builder. Extra, however, comes with something the Divi theme doesn't have, and that's an Ads Module you can implement using the Category Builder feature. This allows you to place a banner ad nearly anywhere you wish. UnoBlog is a simple grid WordPress theme for serious bloggers who want to monetize their blogs with Google AdSense. The design of the UnoBlog theme was inspired by large and content heavy online media blogs. You can easily display advertisements through built-in optimized ad widgets which have been tested for maximum impressions and CTR. Overall this nice blogging theme also is lightweight, fast loading and SEO optimized.